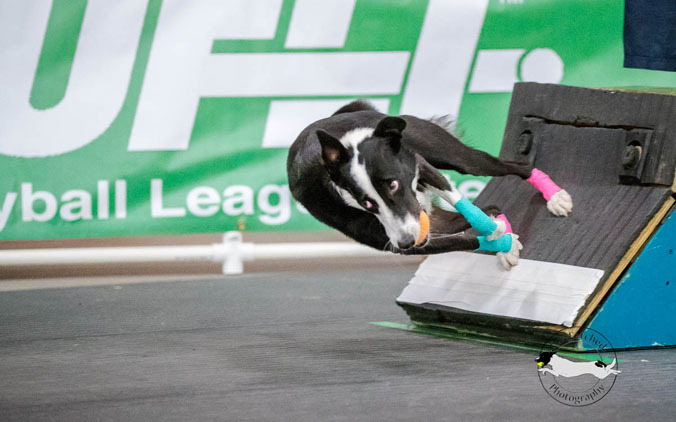 Flyball is a fun and absolutely electrifying sport for canines that got its start in Southern California in the late ’60s/early ’70s. It developed out of hurdle racing, and came into its own when Mike Randall built the first flyball box (which he demo-ed on the Tonight Show with Johnny Carson), an apparatus that launches a tennis ball when the dog hits it. Flyball is a hurdle relay race, with two teams racing one another, side by side. Each dog jumps four hurdles, hits the flyball box (releasing a tennis ball), grabs the ball, does a 180 degree pivot, and races back, jumping over the same four hurdles. Part of the challenge of the race is timing; if the next dog passes the start line before the previous dog has finished its run, that dog will have to do a second run at the end of the race. The turns the dogs do on the flybox are positively acrobatic. After the last hurdle, the dog launches itself into the air, often hitting the box with all four feet at once, grabbing the ball as it releases at the same time the dog is twisting its body to completely change direction in a split second. This is a sport for all sorts of dogs, both breeds and sizes. There is a benefit to teams including at least one smaller dog, as the hurdle size is determined by the height of the smallest dog on the team (called the “height dog”) at its withers (they round that number down to the nearest full inch, then subtract 5 to get the hurdle height). The minimum hurdle height is 7 inches, the maximum is 14 inches. If you’re interested in flyball, check out the tournament schedules on the North American Flyball Association and UFLI (United Flyball League International) websites. (And be sure to check out petswelcome.com to find a pet-friendly lodging if you’ll be staying overnight with your dog!) These tournaments can include different classes of races, like Multi-Breed or Variety (four different breeds on each team) and Veteran (dogs age 7 and older). Tournaments are open to all dogs, including mixed breeds. Regarding scoring, dogs are awarded points based on how fast the race was run, and those points accumulate over the course of the dog’s racing life. Twenty points earns the pooch the title of Flyball Dog; 30,000 and that pup is a Flyball Grand Champion.